A distinctive glaze which Royal Doulton make use of, it consists of a rich, deep-red glaze slashed with streaks of purple and turquoise used to decorate pottery, particularly porcelain. The effect results from a particular method of firing a glaze that incorporates copper; the method was first discovered by the Chinese of the Ming dynasty, probably during the reign of Wan-li (1573-1620). 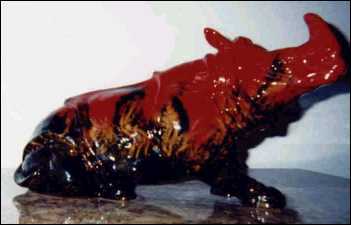 Examples of this old flambé work are now extremely rare. The process was at first difficult to control, but by the reign of Ch'ien-lung (1736-96) in the Ch'ing dynasty it had been mastered, and ch'ui hung, or blown red glaze ware, as flambé work was called, became very popular. The porcelain factory at Sèvres (France) produced a substantial amount of flambé work in the late 19th century. The process was revived in modern times by individual potters, notably Bernard Moore in England, who worked at the beginning of the 20th century. The marbling effect on this piece is exquisite. It measures approx. 9 1/2" tall and approx. 13 1/2" long. 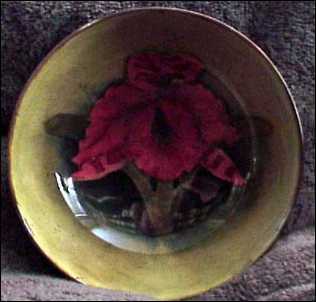 A unique style of bowl from Moorcroft. glazing covering a deep, rich cobalt blue. 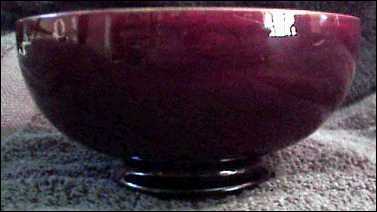 This footed bowl stands 2" tall and has a diameter of 4 3/16"